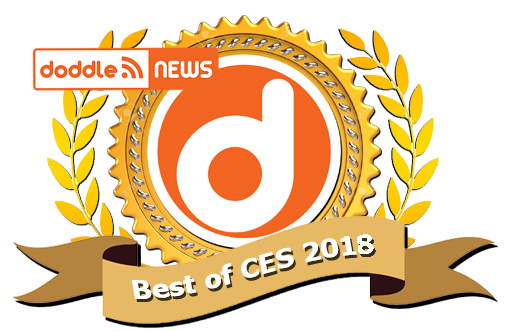 CES 2018 will have to go down as one of the most dull tech shows in recent memory. At least when it comes to filmmaking. But to be fair, everyone in our game is keeping their powder dry until NAB in April. But there were some shining spots coming from the showroom floor, and we found them. Best Camera. This one is pretty much a given. 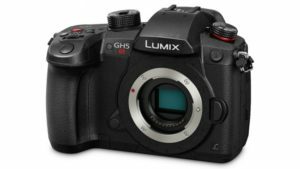 While there were other offerings out there, the Panasonic GH5s gave the largest splash. Aimed squarely at film and video production, the latest generation of the Lumix micro four thirds mirrorless line was more of a major dot update than an upgrade. Panasonic did replace the 20MP MFT sensor with one half it’s size, but it’s multi aspect design offers larger pixels, and therefore double the light gathering capability (to an ISO of 51,200). It also records Hybrid Log Gamma in 10 bit 4:2:2 4K internally. But sadly, having lost its popular in camera image stabilization feature as a result. Best Camera Accessory. 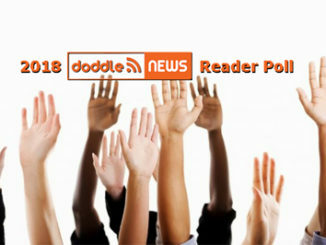 You know we’re going to give a best award to a product that we can’t wait to hit the market so we can buy it. And that holds true for DJI’s Osmo 2 Handheld Smartphone Gimbal. First off, DJI dropped the price to $129, making it sinfully affordable for everyone. 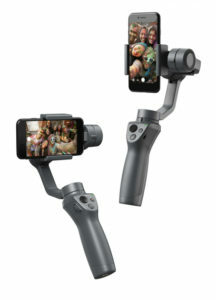 DJI didn’t cut corners to do it, however, as the Osmo 2 has great new features including DJI’s Smooth Track technology, portrait and landscape modes, and a 15 hour battery life. There’s also the Ronin S, which is designed to carry cameras as large as a DSLR or Mirrorless camera. Both make our list. Best Audio Product. The Zoom H1 was my first digital audio recorder, and I’m still using it for backup audio tracks on my video shoots, and for interviews. 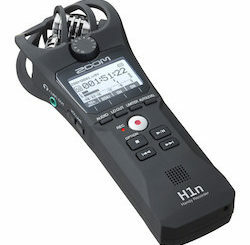 But it needed an update, and Zoom has given us one with the Zoom H1n. The basic guts of the H1n are similar to it’s predecessor, but improved with 24 bit recording at up to 96 kHz in Wav, with adjustable playback speeds and an audio slate for syncing to your video in post. The H1n can also overdub with an unlimited number of layers. It’s a fantastic improvement over an already solid digital recorder. Best Drone. 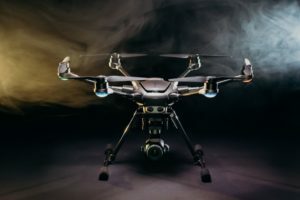 With GoPro out of the drone game now, and DJI sitting pretty with a pair of products that they announced last fall, there was an opportunity for a third party drone maker to make a huge splash in Vegas. And Yuneec made the most of it with their new Typhoon H Plus Six Rotor Hexcopter. With a 4K camera swivels 360° and houses a 1 inch 20 mp CMOS sensor and high aperture lens, the THPlus captures 4K at 60 fps with improved low light performance. It also incorporates Intel’s Real Sense technology working in concert with”ultrasonic proximity detection” for collision avoidance, has retractable landing gear, and it’s controller as a 7 inch HD display. The Typhoon H plus will be out by summer for $1799. They really should’ve called it the Bat. Best Editing Product. 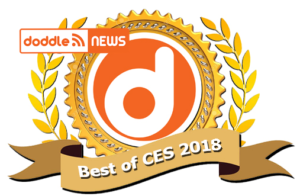 There were plenty of laptops on the showroom floor this year, but frankly, with all the talk about the Spectre security flaw affecting all computers in the last ten years, I think that it pays to wait until Intel, AMD and others plug the gaping hole in their processor architecture. That and these days there really isn’t much performance improvement in the laptops we did see. Just a few catchy new designs. So that leaves me to think about accessories, and the Asus Bezel Free Kit was certainly the most exciting thing I saw out there. 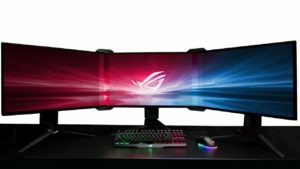 Turning a three screen workstation into an immersive, one screen experience, the Bezel Free Kit uses a technique called optical refraction to merge the ends of each monitor and hide the bezel that separates them. Thin lenses are placed along the seams and the light is simply bent around the divide. It’s pretty clever and was hands down the best idea I saw this year (Aflac duck robot notwithstanding). 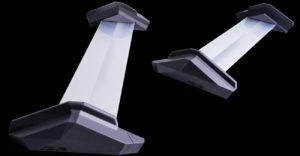 Best Mobile Concept. It’s hard not to do a Best of an not give something to Razer. It seems that the computer company goes to Las Vegas just to show off what their R&D guys are playing with. And this year is no exception. Project Linda is an interesting idea that incorporates a computer workstation with Razer’s own Android smartphone, which I believe Linda is meant to showcase. 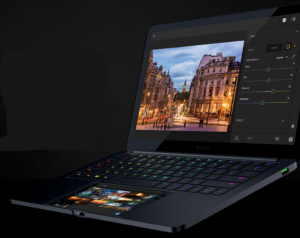 Running Android, Razer’s concept mobile phone is the brains behind the Linda laptop. 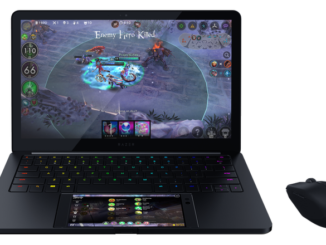 The laptop shell is is very similar in design to Razer’s Blade gaming computer, but the phone slips into the space traditionally meant for a touch pad and powers the workstation. While doing double duty as a touch pad. It’s not the first time someone has played with this idea, Motorola and Samsung have both tried to merge the two technologies. But this is by far the most interesting at this point. Razer also designed a cool new wireless mouse that has no batteries and runs on electricity generated by the mouse pad below it. With no battery weighing it down, it’s incredibly lightweight device that will never die as long as the mousepad has a steady current. Being Razer though, who knows if Linda will ever make it to market. The three screen Project Valerie laptop didn’t, and neither did Project Christine, the modular desktop design concept. The only thing we can really be confident in, is if it’s a Razer prototype at CES, someone is going to try and steal it. Best in Show. Simply because it’s a simple design that ultimately won’t be proprietary, I’m going to have to go with the Asus Bezel Free Kit. Whether for editing, virtual reality projects, or just playing your favorite first person shooter, the Asus Bezel Free Kit is a clever design that will make for a completely immersive experience and make our post production workflow a lot easier. Perfect? No. Practical? ABSOLUTELY. And that’s a hell of a start. See you back in Vegas in April, folks!